With the introduction of the single European currency, the European Union has become ubiquitous in the minds of political leaders. Yet, this is not a new idea. In Greece, we find traces of monetary alliances until the 5th century BC. commercial, to facilitate trade with neighboring states. Some common currency types then allow, although struck by different entities, to link these emissions to a common monetary system. 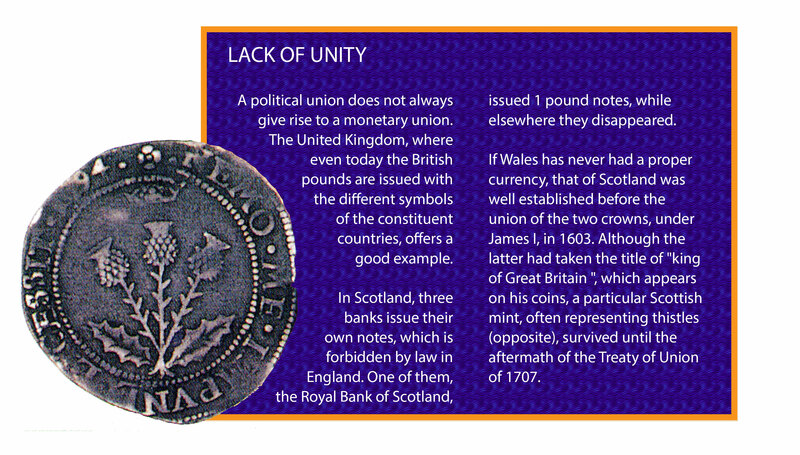 Often, the link that united the currencies came from trade agreements. Having interchangeable currencies made international trade easier. These trade-based alliances sometimes received a formal status, as in the 1469 agreement signed by England and Burgundy, which stipulated that their currency could be used in both countries. In some cases, popular currencies, such as the besant, the florin, or the thaler, were so widely used by merchants that some foreign sovereigns were forced to accept them and to adjust their own currency to similar standards. The first monetary unions were born in the 5th century BC between Greek city-states, such as Corinth, which had founded settlements all around the Mediterranean Sea. These colonial coins bore the symbol of Corinth - Pegasus, the winged horse -, along with the name of cities such as Corcyra or Syracuse. Other unions were sealed between independent cities but united by political alliances. In ancient Greece, small cities came together to resist cities that emitted powerful currencies, such as Athens, and their domineering ambitions. Rome was at the origin of one of the largest and most durable monetary unions. From the first century AD the Roman coins circulated around the Mediterranean Sea, and the monetary system developed as the Roman Empire expanded. But that does not mean that the coins issued were identical. Some of them had indications about the workshop that made them. It seems that they circulated mainly in the provinces where they were produced, even if many copies of one region were sometimes found in another part of the empire, which can be explained in particular by the campaigns of the Roman army. After the collapse of the Roman Empire in 476, the Eastern Roman Empire survived in Byzantium, and the gold solidus that was produced there remained, until the thirteenth century, the main gold coin circulating in Europe. In the West, the various barbarian kingdoms that were formed after the fall of Rome mostly adopted Roman coinage and often made solidi gold in the name of the reigning Byzantine emperor. Even after the emergence of coins minted in the name of more national rulers, the currencies of these countries, still influenced by the gold solidus or the silver denarius, adopted, to a large extent, the monetary types of the Roman models. The same scenario was repeated when Charlemagne (768-814) founded the empire that was to cover most of Western Europe. He implemented a reform that standardized the monetary system, each currency bearing the name of the workshop from which it came. Once the empire dislocated in 840, upon the death of Louis the Pious (son of Charlemagne), some local lords continued to strike similar coins to enjoy the reputation attached to them. During the thousand years that followed the collapse of the Carolingian Empire, no trace of monetary union of such magnitude was seen. But there were a multitude of more modest ones. Some were official, as attested by the series of treaties signed in the 14th and 15th centuries by the Rhineland sovereigns. The latter issued coins of the same size and quality, and bearing the same designs. At the same time, agreements were concluded between the trading cities of the Hanseatic League. In both cases, however, the conventions were unsustainable and needed to be constantly renewed or revised. The number of unofficial unions is very high. Popularized by trade, currencies such as the Venice florin or the Spanish silver dollar were accepted in different countries, even when they were not legal tender. As international trade developed and the 19th century industrial revolution loomed on the horizon, large-scale currency unions reappeared. 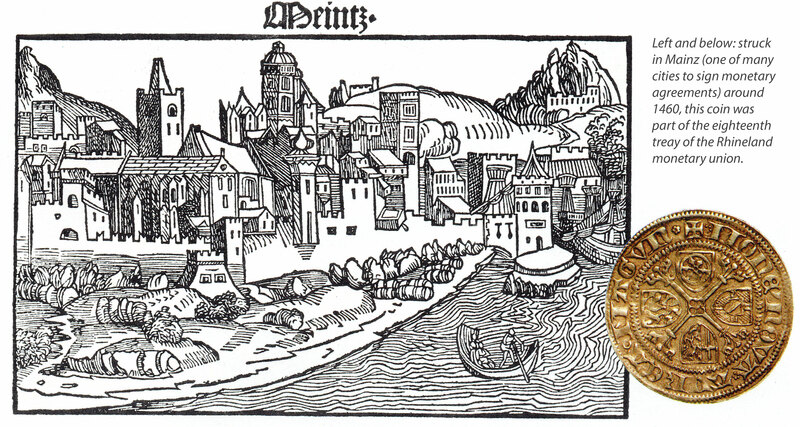 It was felt that a coin of gold and silver produced according to the same criteria would facilitate trade. In 1863, France, Italy, Belgium, Switzerland and Greece produced coins that conformed to a common standard, that of the Latin Union, and which differed from each other by their sole denomination. Subsequently, Spain, Serbia, Bulgaria and Romania adjusted their respective currencies to join this organization. Monetary unions, on the other hand, are not immune to minor cheating between issuing states. For example, Greece was "expelled" from the Latin Union in 1908 (before being reinstated in 1910) for producing gold coins with a lower precious metal content than other members of the Union. A similar convention was signed in 1873 by Denmark and Sweden, to which Norway adhered in 1875. Both unions were successful, but still aligned with the international gold standard. At the outbreak of the First World War, the gold standard was abandoned and, along with it, the currency unions. Since then, every European currency has followed its own path.